What attracted you to Single Father? First, and foremost, the script. It's just one of those scripts that arrived fully formed. The way it talks about family life and the way that Mick [Ford] draws the characters of the kids is just so beautifully done. It's funny, true and clever. I've been fortunate to have experienced that a couple of times before but really it's so rare. When those gems arrive you just have to say 'yes' straightaway. What is it about Mick Ford's script that makes Single Father "must watch" TV? I think it's just surprisingly accessible - whether you have kids or not it's very recognisable. It feels very human and very real and the characters are so beautifully drawn in the script and I think we were extremely fortunate with the cast, which just means they've created this perfect little world. 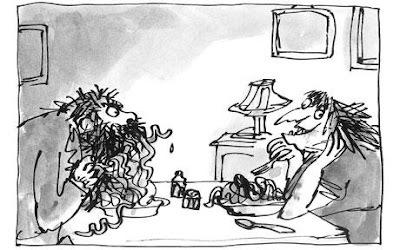 All the quirks of family life are there. As the drama starts with a death, would you say it's a tear-jerker? According to a poll carried out by the College of Optometrists David Tennant is one of the sexiest celebs to wear glasses. He came 4th in the list. Dr Susan Blakeney said: "It's great to see such an eclectic mix of celebrities that people think look good in glasses." David Tennant has narrated a new documentary for the BBC, Polar Bear: Spy On The Ice, and it will be broadcast tonight on BBC One at 20:00pm. BBC Scotland will show it at a later date on 31st December at 8:40pm. Shot mainly using spy cameras, this film gets closer than ever before to the world's greatest land predator. Icebergcam, Blizzardcam and Snowballcam are a new generation of covert devices on a mission to explore the Arctic islands of Svalbard in Norway. Backed up by Snowcam and Driftcam, these state-of-the-art camouflaged cameras reveal the extraordinary curiosity and intelligence of the polar bear. Synopsis By John Nicholson and Richard Katz. A Christmas Carol, but not as you've ever heard it before. An all-star cast gather to bring Dickens' timeless classic to life. 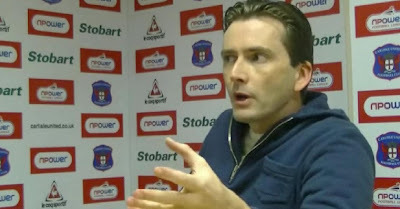 David recently gave an interview to the Carlisle United website about his new role in the BBC drama, United. He was at the club's grounds to film scenes earlier this month and spoke about his role as trainer Jimmy Murphy. Click here to visit the site and watch the inteview. David may not be making his usual appearance in a Doctor Who Christmas Special this year (boo hiss..) BUT fear not as he is making a lot of appearances in various guises over the festive season guaranteeing any fans a happy holiday! David has been nominated for Hello Magazine's Most Attractive Man Of 2010 Poll. He is currently in third place lagging behing Hugh Laurie and Gerard Butler. You can vote for him here. Many, many thanks to all of you who have sent your lovely messages and wonderful works of art for this year's Christmas Book. The amazing artwork you can see above comes courtesy of our competition winner Ezgi Koyagasioglu. This is the cover art for the book this year. Thanks to those of you who have asked about contributing towards the ever growing printing costs of the book. If you would like to donate you can send a paypal payment to sarah@david-tennant.com Anyone who does donate will recieve a thank you on the site and in the book. David took to the trading floor in London yesterday to help raise money for charity. He was among a group of high profile people including Prince William, Geri Halliwell and Daniel Craig who all manned the phones at global firm ICAP. The firm donated the day's revenues to over 200 good causes. Download David reading A Night With A Vampire! Gorcha sets off on a mysterious mission but tells his family not to accept him if he should return after 10 days - for then he will be a vampire. Read by David Tennant. Guy de Maupassant's striking psychological tale enters the world of the Vampire and how it corrupts and destroys the brain. Read by David Tennant. Luella Miller seems incapable of helping herself. But everyone who comes to her aid soon ails and dies in their efforts. Read by David Tennant. In this true struggle between good and evil, heaven and hell, Theophile Gautier creates a whirlwind world of sensuality, seduction and rampant vampirism. Read by David Tennant. Single Father is out on DVD today! Not only does it have all four fabulous episodes of this stunning drama, but it also includes a speacial 'Making Of' feature! Click here to order it from our online store for just £12.91! Download David narrating Radio 2's How Roald Dahl Shaped Pop here. On the twentieth anniversary of Roald Dahl's death, David Tennant tells a new tale of the unexpected - the stamp he's left on the world of pop.Kate Nash reveals how Dahl's fantastical children's books have influenced her own storytelling style, stirring her to invent surreal characters and magical places in songs like Mariella and Little Red.Kelly Jones of the Stereophonics explains how he found inspiration for songs such as I Stopped To Fill My Car Up in Dahl's grisly, suspenseful short stories.Plus, David reveals how a song about Willy Wonka gave a Rat Pack legend his only U.S. number one. METRO passengers thought it was a Tardis they’d stepped into and not a train when former time lord David Tennant was spotted at a North station. The Scottish star appeared in full 1950s garb alongside Sunderland-born star Melanie Hill and some nostalgic props as part of a film shoot in Tynemouth, North Tyneside. The coastal spot doubled as a set for the day as part of a new BBC dramatisation of the 1958 Munich air crash. The pair were on Tyneside for his latest role as one of the talented Manchester United team which became the youngest side to win the league, only for the squad to be ripped apart when eight were killed in the disaster. Called ‘United’, the drama aims to bring to life the tragic event which virtually wiped out manager Sir Matt Busby’s team, nicknamed Busby’s Babes, and the battle to overcome the devastation. 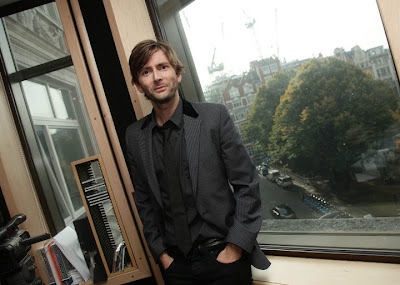 David is back as the host of Masterpiece Contemporary on PBS in the USA. 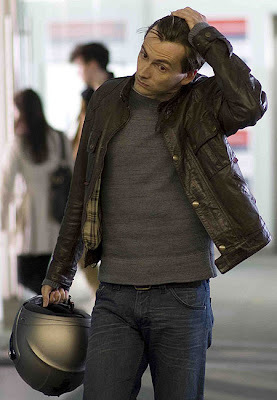 He recently introduced Lennon Naked starring Christopher Eccleston. You can view a trailer above. The full schedule can be seen here. Have you always been an admirer of David's snazzy togs? Have you often pondered that he should recieve an award for his choice of natty suits and jazzy shirts? If the answer to these questions is a resounding yes then you need to head over to the GQ website and ensure that Mr Tennant is suitably honoured by nabbing their Best Dressed Award. 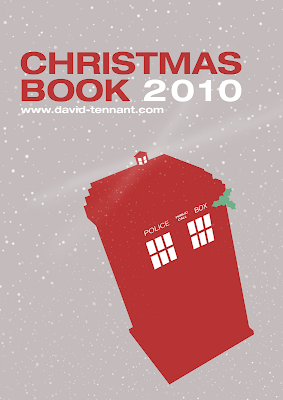 As most of you will know, every year we offer you the chance to send a Christmas message to David via our Christmas Book. This year we would like you to send your messages via our Facebook page here. All messages must be in by no later than 12:00pm GMT on 1st December 2010. 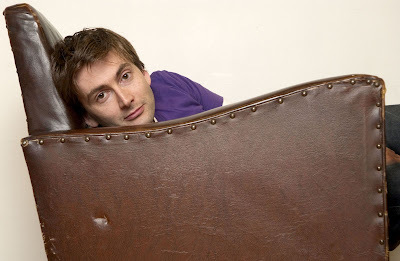 We can confirm that the seat in the new Royal Shakespeare Theatre in Stratford Upon Avon that will be dedicated to David Tennant will be seat number C50. You can download a seating plan here. You can read more about how fans of David donated money for the seat in his name here. David was on BBC Radio 2 narrating How Roald Dahl Shaped Pop. You can listen to it via BBC iPlayer here. On the twentieth anniversary of Roald Dahl's death, David Tennant tells a new tale of the unexpected - the stamp he's left on the world of pop. Kate Nash reveals how Dahl's fantastical children's books have influenced her own storytelling style, stirring her to invent surreal characters and magical places in songs like Mariella and Little Red. Kelly Jones of the Stereophonics explains how he found inspiration for songs such as I Stopped To Fill My Car Up in Dahl's grisly, suspenseful short stories. Plus, David reveals how a song about Willy Wonka gave a Rat Pack legend his only U.S. number one. 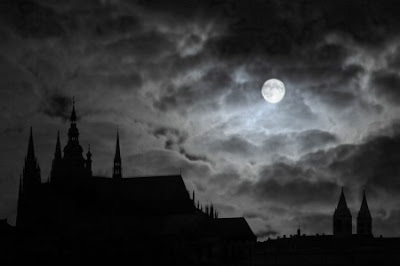 David is curretly on BBC Radio 4 reading A Night With A Vampire. The first one aired last night. You can catch up with it on BBC iPlayer here. Leo Tolstoy's lesser known brother has written this compelling story about a patriarch who sets off on a mysterious mission but fears he may come back a Vampire. If he should return to their village after 10 days - he begs his family to deny him access and plunge a stake through his heart. Producer: Clive BrillA Pacificus production for BBC Radio 4. After an unusual Brazilian ship enters the harbour - our hero suddenly begins to feel unwell, and starts to have feverish and disturbing visions. Only too late does he discover the demonic nature of the South American ship's cargo. 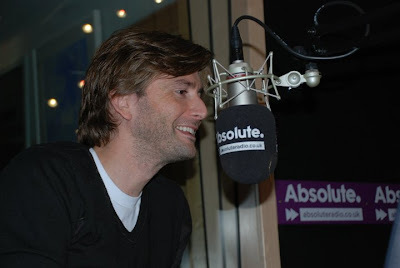 Written by Guy de Maupassant.Read by David Tennant. United is based on the true story of Manchester United's legendary "Busby Babes", the youngest side ever to win the Football League, the 1958 Munich Air Crash that claimed eight of the their number and the extraordinary spirit of a city that rebuilt the team in the wake of the disaster. 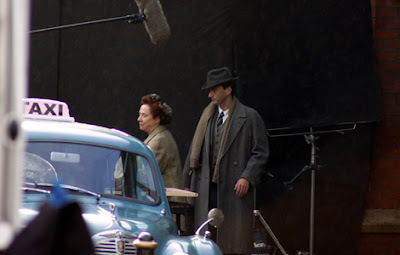 David Tennant will star as coach Jimmy Murphy, alongside Jack O'Connell (Skins, Dive) as Bobby Charlton, the youngest of the Babes, and Sam Claflin (Pirates Of The Caribbean, Any Human Heart) as star player Duncan Edwards. Manager Matt Busby (the source of the team's nickname) is to be confirmed. The film draws on first-hand interviews with the survivors and their families to tell the inspirational story of a team and community overcoming terrible tragedy. The Munich Air Crash killed 22 of the 44 passengers onboard, including supporters, journalists and embassy staff. If you missed any of David co presenting the Breakfast Show with Christian O'Connell this morning then you missed a treat! However fear not as the podcast is available for you to download here. And view some fab pics of David, Christian and co here. 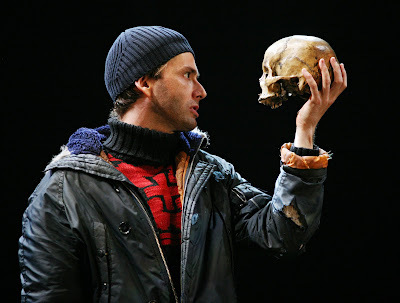 In anticipation of his own stage Hamlet in 2011, Michael Sheen looks back at classic productions of the play and the many different interpretations of a young actor's most coveted role. The last few years have seen a glut of high-profile Hamlets in the British theatre, culminating recently with Rory Kinnear at the National Theatre in London and John Simm at Sheffield Crucible. Michael Sheen, who is due to play the role at the Young Vic in 2011, asks why Shakespeare's play remains very much the thing for 21st century audiences. He considers the rich archive of Hamlets from the theatre, cinema and radio archives, starting with Sir Herbert Beerbohm Tree in 1908 and journeying to the present-day, taking in the interpretations of John Gielgud, Laurence Olivier, Richard Burton, Jonathan Pryce, Kenneth Branagh and David Tennant, as well as female Hamlets, Sarah Bernhardt and Frances de la Tour. Don't forget that David will be co hosting the Absolute Radio Breakfast Show with his pal Christian O'Connell tomorrow morning from 6am. Great news! David Doodle T.shirts & Pillowcases are now available for overseas fans and online! The Headway Essex webshop is now open for business. Which means that David Tennant fans can now order the fabulous David Doodle merchandise online and pay with Paypal. Headway Essex would like to thank fans for their patience and support. David Tennant the Patron of Headway Essex has exclusively designed a fantastic doodle to raise funds for the brain injury charity. 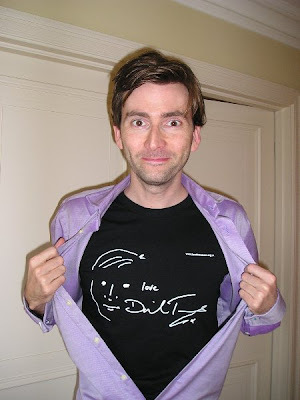 If you want to keep David close to your heart the David Doodle T-shirt is just what you need! These t-shirts are the ultimate Ethical shirt made from organic cotton. They come in both male and female fit with a full range of sizes. For the more adventurous among you, you could always rest your head and ‘Dream with David’ on your very own David Doodle Pillowcase! This contemporary style black doodle on a white cotton mix pillowcase looks fabulous. 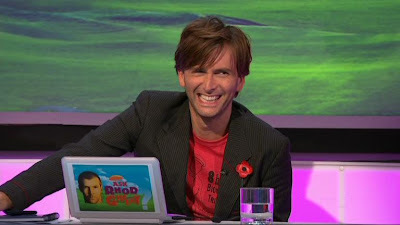 You can now download a collection of screen caps from David's appearance on Ask Rhod Gilbert here. We are pleased to announce that the winner of our Royal Shakespeare Competition to attend a special event on 5th December 2010 in the new Royal Shakespeare Theatre for seat donors is Ella Humphreys. We hope you have a great time Ella! We'd also just like to say thank you again to everyone who donated for the seat and also to all of you who entered the competition. We will have some photos of the seat as soon as the plaque is on so keep a look out for those! The over night ratings for episode 3 of Single Father are in. It managed to draw 3.878 million viewers, a 14.5% share. The BBC HD simulcast added a further 194,000 (0.7%). Final figures are likely to be higher. Don't forget that David is a guest on Ask Rhod Gilbert tonight at 10:35pm on BBC One England and Scotland. It's on tonight at 11:05pm in Northern Ireland and BBC Wales will air it on 27th October at 10:45pm. You can now downlaod screen caps from episode 3 of Single Father here. Read a review of episode 4 from Last Broadcast here. 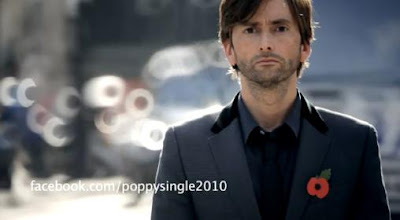 David appears in the video for the British Legion's new charity single. They are aiming to boost funds by releasing a fund-raising single - of silence. The novel idea includes a silent single and video with no music, just occasional background noise. The legion hopes the release will help it beat last year's record-breaking appeal total of just under £35m. Legion spokesman Liam Maguire is optimistic that the single will galvanise people into donating. He said: "Where have you seen the prime minister and the lead singer of Iron Maiden in the same music video together? "The reaction on Facebook has been amazing; we've had over 3,500 people sign up in the last 24 hours, so we're hoping the reaction is just going to be huge." Screen Caps from episode 2 of Single Father can now be downloaded here. The over night ratings for Single Father are in and it managed to secure 4.35m (16%) on BBC One in the 9pm hour and 234k (0.9%) on BBC HD. Episode 1's final rating were 6.04m, which doesn't include any iPlayer watches or recordings. With the inquiry into Rita's death looming, Dave faces some difficult, and life-changing, choices in the conclusion to Mick Ford's humorous romantic BBC One drama. Sarah and Dave have fallen in love but, while Dave excitedly makes plans for their future together, a cautious Sarah fears that they're rushing things. Dave is furious after discovering that Stuart told Lucy about the forthcoming inquiry into her mother's death. 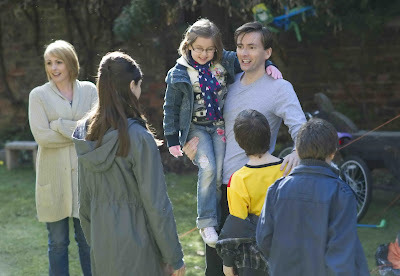 And, to make matters worse, both Lucy and Ewan plan to attend – against Dave's wishes. 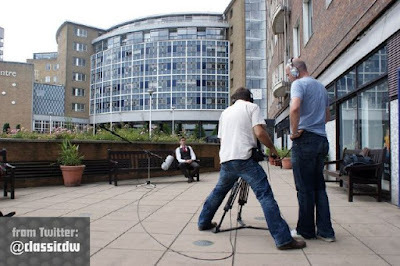 David has recorded a shoot for the Doctor Who Revisitations Volume 2 DVD Box Set which will be released in 2011. Revisitations is a boxset containing updated and remastered versions of previous Doctor Who DVD releases with extra discs of special features. 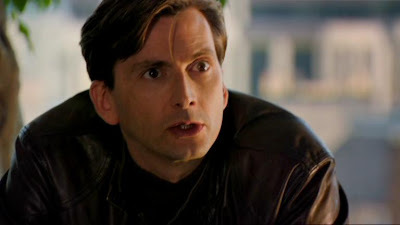 Dreamworks have announced that the release date for David's movie, Fright Night, has been brought forward. 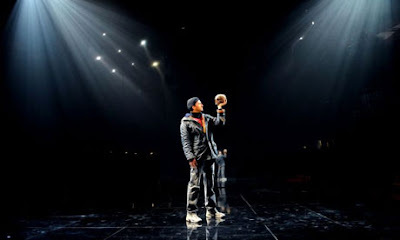 It will now be released on 19th August 2011. But if you head over to iTunes it's also avaialble there and Christian would love it if it could get to No.1 in the iTunes chart. 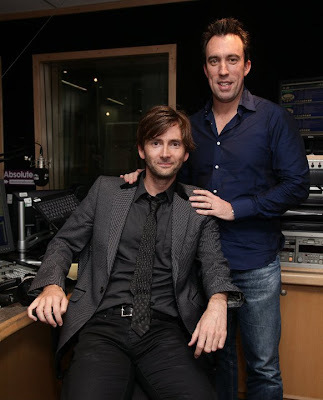 David will be co hosting the Breakfast Show with Christian in the next few weeks. David will be a guest on Ask Rhod Gilbert on Monday 25th October at 10:35pm on BBC One. 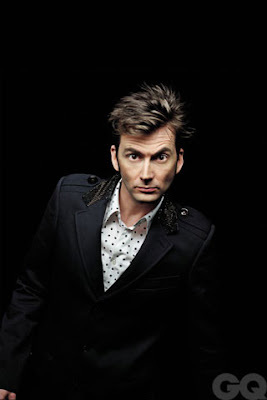 The comedian is joined by actor David Tennant, comic Adam Hills and actress Rita Simons, and uses archive footage, studio demonstrations and live link-ups from around the world to answer the public's burning questions, with the assistance of panellists including his flatmate Lloyd Langford and Inbetweeners star Greg Davies. 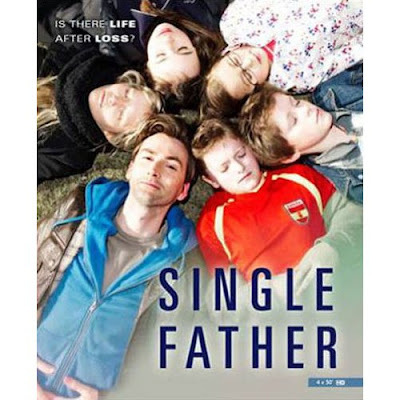 Single Father will be released on DVD on 29th November 2010. You can pre order it in our store here. It is also available in the BBC Shop here. Screen caps from episode 1 of Single Father are now available to download here. 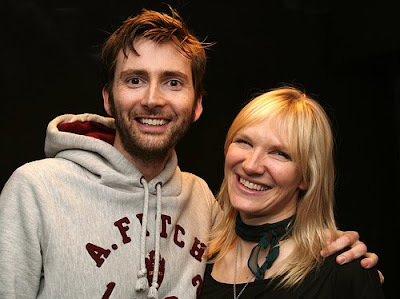 David was a guest on Radio 1 with Jo Whiley yesterday afternoon. Click here to download his interview. Thanks to Vanessa. If you missed episode 1 of Single Father then visit the BBC Single Father website here to catch up. Single Father has recieved a great reaction from fans of David here are a few comments we recieved via our Twitter page. We also had many hundreds of emails all praising the show and David's performance, so thank you for those too! 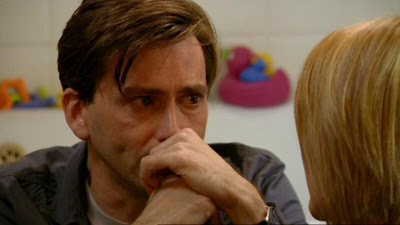 @davidtennantcom Beautifully realized thought provoking study of grief that stirs the emotions making you reflect on your own relationships. 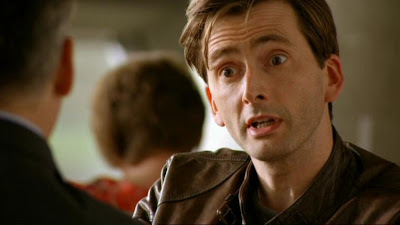 @davidtennantcom it was bloody brilliant. 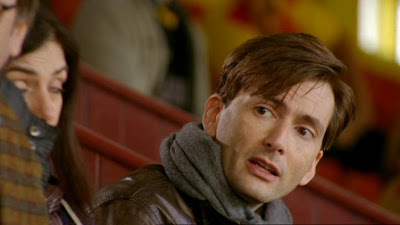 U really see how fab an actor David is and cry I sobbed all the way through brilliant lol.